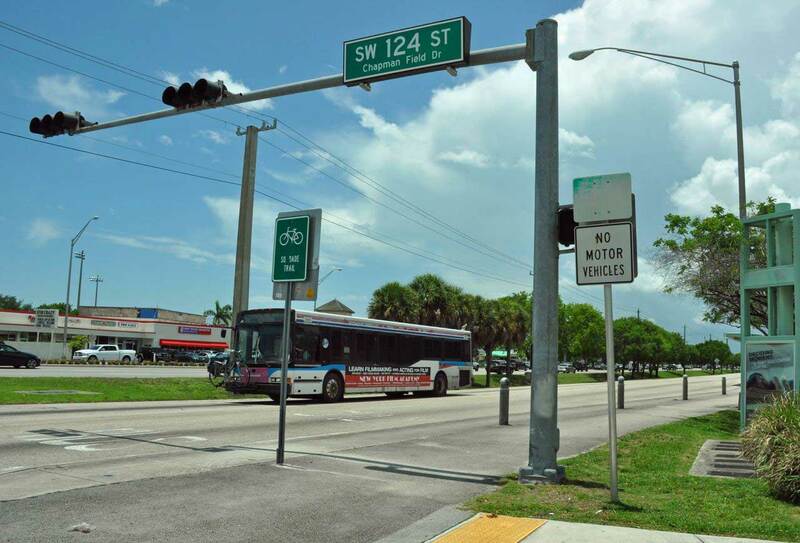 A Transportation Planning Organization choice of bus rapid transit (BRT) for the South Dade Transitway last week all but dashed the hopes of many residents of Metrorail expansion along the county’s southernmost corridor. The 15-7 vote was a significant step toward “Gold Standard” BRT on the 20-mile right-of-way along US 1 championed by many, including Mayor Carlos Giménez. But it’s not a done deal, said Sean McCrackine, chief of policy and planning for the county’s eighth district, as county commissioners must still approve local funds. “The project doesn’t go forward without a local commitment for funding the construction and long-term operation of whatever the proposed system is,” he wrote. Local funds for BRT from Kendall to Florida City would come from the People’s Transportation Plan (PTP) half-cent sales surtax approved by voters in 2002 to expand transit. The project needs about $100 million in PTP funds, the same amount the planning organization’s board OK’d last week in amendments to the long-range transportation plan and 2018-19 Transportation Improvement Program. Local funding matches are vital to get state and federal aid, including “Small Starts” grants from the Federal Transit Administration (FTA), said Chris Ferreira, an aide to Commission Chair Esteban Bovo Jr. Eight of 13 commissioners voted for BRT. Audrey Edmonson, Barbara Jordan, Daniella Levine Cava, Dennis Moss and Xavier Suarez voted no. Those numbers put the administration in a confident position for BRT. But if just two commissioners shift sides before the funding vote things become tenuous, said Javier Betancourt, executive director of the Citizens’ Independent Transportation Trust, which oversees the PTP. An amendment to the BRT item stipulated the transitway would shift to Metrorail once weekday riders hit 35,000, a benchmark Ms. Jordan said can’t be reached. That requirement could be further reduced, Mr. Bovo said last week, if a private company proposed a better solution. Give the people what was promised which was RAIL or RETURN THE HALF PENNY TO THE PEOPLE!!!!! Ban AECOM from Dade County contracts. Reveal bilzin sumberg’s cost to taxpayers. No more county contracts for MCM. That’s just the start of the Pushback. Replacing a disfunctional Busway with a Busway is Brilliant! Special Thanks to all that made it possible! FINALLY, common sense prevails!! Build Gold Standard BRT that we can afford NOW and rail if it proves necessary. RAIL IS WAY TO EXPENSIVE AND TAKES TOO LONG TO BUILD!!!!!! It’s truly shameful how the county has allowed thousands of homes to be built in South-Dade County, causing unbelievable traffic congestion as we try to head out in the morning. They happily take the property tax revenue and the permits from the developers, to name just a couple of the ways they are benefiting from the sprawl in my neck of the woods. There have been no incentives to bring businesses, and therefore jobs, to areas south of Cutler Bay. Our only choice is to get on the roads, the congested Turnpike and US1. How nice to take our money and then refuse to give us alternate ways of commuting out of here.